We hope this finds you all well as the warm weather of early summer　settles in. 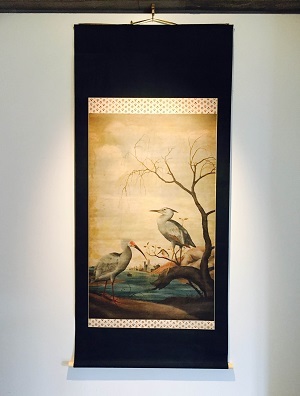 Greeting you at the entrance of our latest exhibition, and perhaps offering visual respite from the heat, is a work we are displaying for the first time, Willow and Waterfowl in Winter, by Shiba Kōkan (1747 - 1818). Kōkan trained in the Kano school and went on to become an ukiyoe-style painter, after which he is said to have been the first person in Japan to have been heavily influenced by Western painting. As oils and canvas were not readily available in Japan, he attempted Western-style oil painting on silk, using pigments mixed with egoma seed oil, which was primarily used for water proofing umbrellas at the time. 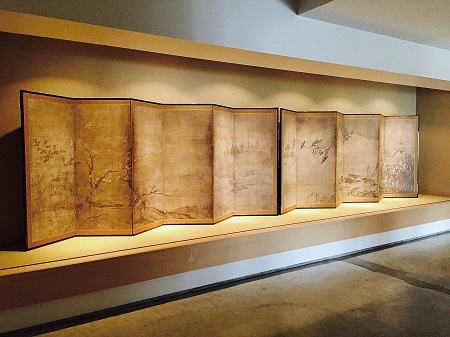 Also on display are a pair of flower-and-bird screens from the Unkoku school, a new discovery also being exhibited here for the first time. The right screen features a number of plovers in flight, while the left screen features a plum tree branching off horizontally into the pictorial plane. We hope that you will take the time to come by and see the show. ※ Please note that certain exhibits will be rotated during this time.